We keep it in home & in our vehicles at all times ,a lifesafer. The grand kids love it! Doesn't dry out. Effective. Easy To Apply. Very handy to carry a couple in a small first aid kit. Effective. Easy To Apply. High Quality. Quick acting. Soothing. Keeps swelling down. Travel. Beaches. Backcountry. Day Trips. BBQ's. Anywhere with Kids. Camping. These are a must to carry along with if you have kids. They work quickly at taking the pain away and allow the tears to stop from your youngster. I have also used this on a wasp sting an quickly relieved the pain with no swelling or soreness the next day. I keep these in my car, home and first aid kit. Effective. Easy To Apply. Long Lasting. High Quality. Easy to take along!. Travel. Beaches. Backcountry. Day Trips. 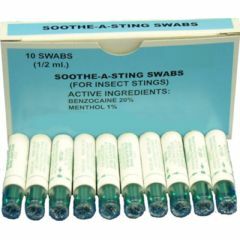 These work really great on bee, wasp or any other stinging insects. Easy to take with you so you have access at all times! Great to have on hand for kids that love playing outside! Bike Rides. Travel. Picnics. Beaches. Running. Backcountry. Day Trips. You must apply on insect bite within 10 minutes to keep swelling away particularly with fire ant bites. It will still itch for a few days but there won't be any swelling which usually lasts a week IF you are allergic to fire ant bites like I am.